Nubra is the northernmost part of Ladakh, with borders both to Pakistan and China. Nubra has a lot to offer, but whoever wants to go there has to first cross one of the two 5000m-high mountain passes. Nubra is one of the three Tehsils (an administrative unit in India and Pakistan) that compose the district of Leh. Geographically, this great valley is enclosed by two major rivers – the Nubra River, after which the region is called, and the Shyok (sometimes also written Shayok). The two come together in an impressive manner near the Tehsil’s capital, Diskit. The two mountain chains that surround Nubra are the Karakoram and the Himalayan Ladakh Range. Nubra is on average 3000m high, making it lower than most regions in Ladakh. To get to Nubra, whether on foot or via taxi/bus, it is necessary first to cross a 5000m-high mountain pass. The best known among them is the Khardong La (also written Khardung La), considered for a long time the highest traversable pass in the world – at its breathtaking 5600m. It has been proven since that this value was not entirely accurate, and the real height of the pass is “only” 5360m. Alternatively, it is also possible to entry the valley through the Wari La, of similar height, but less important for the military. There is therefore no interest or attempt to keep it open all year long, and when it opens, it does so relatively late. The road conditions of these two routes, both before and after the pass, are “not optimal” ;), and make for a tiresome journey. It is expected that things will be better in the future in the Khardong La, since the authorities are constantly working on improvements there. In a taxi, the journey from Leh to Diskit over the Khardong La pass takes approximately 5 hours. Over the Wari La the trip is a little longer… The trip can always be a little longer, anyway: for example if there is a blockage on the road due to construction works. 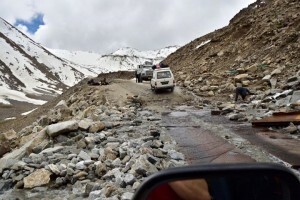 There is another road, from Nubra to Durbuk, along the Shyok River, but it is closed to foreigners, and during summer it’s usually flooded and unpassable. Incidentally: A valid Innerline-Permit (for at least 7 days) is required to visit Nubra. This permit can be requested from local tour operators in Leh. (In our trips, the permit is of course part of the package). Foreigners are allowed to travel freely to Turtuk and Warshi. 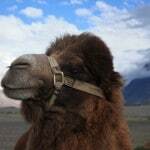 Those who travel to Nubra will be spoilt for choice. Where to spend the night? There are several possibilities. Guesthouses, hotels and deluxe camps can be found in Diskit, Hundar, Tirith, Sumur, Turtuk and Panamik. Most overnight stays are recorded at Hundar. On the newly opened route to Panamik, the infrastructure is still very bad until Warshi and you can hardly find any accommodation. This is also true for the route between Hundar and Turtuk. Worthwhile sights abound. 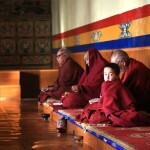 For starters, the southern part is Buddhist and it is possible to visit many monasteries and temples. The two largest are the ones at Diskit and Samstanling, but you will find smaller monasteries and temples in every Buddhist village. A wonderful highlight is the Entsa hermitage, reachable by crossing over the bridge at the village Panamik. The sacred lake Tirisha is also worth a visit, especially during a clear full moon night. Most pamphlets and articles about Nubra mention the hot springs of Panamik… unfortunately they are anything but worth seeing, since they were terribly built and implemented, and don’t leave a good impression. One of the most famous trekking options is the route from Hundar to Phyang (the hike in the opposite direction, from Phyang to Hundar, is only recommended for people who are already well acclimatized to the height). It usually takes 4 to 5 days to walk this route, but there are also alternative paths and detours to make the trip longer, when desired. The highest point is the Lasermo Pass at 5400m. 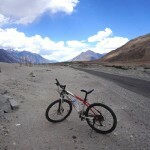 (See also our related blogpost: Which trek in Ladakh & Zanskar fits you? This route is also mentioned there). Another popular route leads from Sabu (neighboring village of Leh) to Diggar over the homonymous mountain pass (Diggar La). This trek is shorter, usually completed in only 3 to 4 days, but it is relatively strenuous due to the quick altitude gain. Less known is the short trek over the Nebuk La (5380m) from Tangyer to Durbuk, in Changthang. 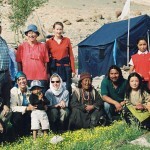 There are still other trekking options that connect Hundar with the Indus Valley in the region of Sham – especially with Saspotse and Ang / Tingmosgang – but some of the routes are at the moment not accessible for pack animals. Additionally, some other routes are currently not open to foreigners due to safety regulations. There are also several interesting mountains to climb – especially the ones that belong to the 7000m high Saser range (Karakorum): Saser Kangri I (7672m), Saser Kangri II (7513m), Saser Kangri III (7495m) and Saser Kangri IV (around 7.400m). Then there are another two 7k peaks in the Mamostong group, plus the Chong Kumdan I (7071m) and II (7004m). Another 7k is the Aqtash (7016m). There are many unclimbed and technically demanding 6k peaks as well. BUT: By instructions of the Indian Mountaineering Foundation, currently it is only possible to climb the mountains of the eastern Karakoram as part of an “indo-joint-expedition”, i.e. a mixed national expedition, in which at least part of it must be indian. There are also several 6k ready to be climbed and conquered in the Ladakh Range, outside the eastern Karakoram. 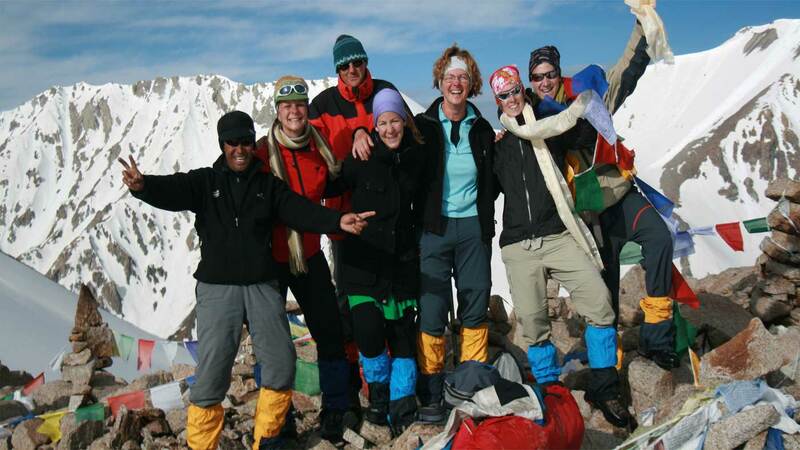 We are always at your disposal if you need further information or suggestions about climbing the many peaks of Ladakh. Trekking Tour of Nubra in the Indus valley over the Lasermo Pass (5400m). Starting with a visit to the classical highlights of Ladakh, the trip soon continues into Nubra, where after a few days of light rest the real hiking through the Indus valley begins. Dates available according to request.